<h2>Understanding immune system switches will spark new drugs</h2><br /><p><strong>Your work focuses on the innate immune system. Can you explain what this is?</strong></p> <p>‘In the past, scientists paid most attention to the adaptive immune system, which is the part that has antibodies that memorises invaders. Most of life on Earth does not have antibodies and defends itself with what we call the innate immune system. I’ve been figuring out the component parts, like the way you’d take apart a car engine. We didn’t know what half the parts of the innate immune system even were. Now that we know more, we are creating drugs (that target this process) to help patients.’</p> <p><strong>One of the effects of the innate immune system is inflammation. Why is this an important area of research?</strong></p> <p>‘The normal job of inflammation is to fix tissues. If you sprain your ankle and get an injury, inflammation is triggered to repair the wound.</p> <p>‘What’s amazing is that inflammation lies at the heart of so many diseases, when it gets out of control. That could be Alzheimer’s in the brain, rheumatoid arthritis in joints, Crohn’s disease in the gut or arteriosclerosis in the blood vessels. Steroids work for several of these diseases. Though steroids have side effects, this shows the diseases follow a common pathway. This gives us hope that if we can find specific pathways we could treat patients with different inflammatory disorders.’</p> <p><strong>Can you give us an example of where this approach is showing promise?</strong></p> <p>‘A type of protein called Toll was discovered in fruit flies, and then versions were found throughout nature. We realised they were important more generally in the innate immune system of organisms, including in people. My lab looked at how (toll) receptors triggered macrophages (immune cells that attack bacteria and other invaders), and discovered a key switch called MAL. These discoveries provided new targets to fire drugs at.&nbsp;</p> <p>‘My interest is mainly in inflammatory diseases like rheumatoid arthritis. The macrophages in rheumatoid arthritis patients somehow get reprogrammed to be overactive, for months on end. Blocking certain toll-like receptors could turn down inflammation and treat patients. '</p> <p> <div class="quote-view quotesBlock quote_horizontal"> <div class="quotesTop"><img src="https://horizon-magazine.eu/sites/all/themes/horizon/images/quotes_top.png" alt="" title="" /></div> <p>'What’s amazing is that inflammation lies at the heart of so many diseases. '</p> <blockquote><p>Prof. 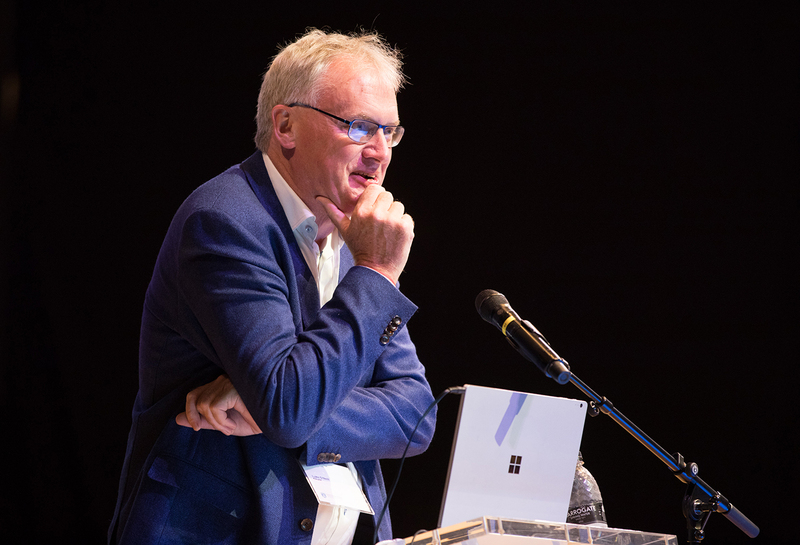 Luke O’Neill, Trinity College Dublin, Ireland</p></blockquote> <div class="quotesBottom"><img src="https://horizon-magazine.eu/sites/all/themes/horizon/images/quotes_bottom.png" alt="" title="" /></div> </div> </p> <p><strong>What other examples of chemical switches there?</strong></p> <p>‘What’s really exciting right now are checkpoint proteins, which were discovered a number of years ago. These are off-switches in the immune system to stop it running out of control. One is called PD1. A (cancer) tumour flicks the off switch, a cunning strategy to stop itself from being attacked. Now drug companies have developed a way to block that off-switch using checkpoint blockers. Once you do that, the cancer can be attacked by the immune system. We’ve been studying these switches.’</p> <p><strong>What’s next? </strong></p> <p>‘The brain has come into focus. We are more aware now that immune dysfunction is involved in diseases like Alzheimer’s and Parkinson’s disease, but also depression and, amazingly, schizophrenia too.&nbsp;</p> <p>‘(We are) looking to block inflammasomes. These are switches on macrophages, which are frontline immune cells, that sense danger. If they detect something noxious, such as the beta-amyloid proteins in Alzheimer’s, they drive inflammation. We could stop inflammation going into overdrive and perhaps get new medicines for Parkinson’s and Alzheimer’s. Wouldn’t that be great?’&nbsp;</p> <p><strong>Recently you happened upon a drug that had been tested and dropped, but you believe this drug can be used for patients?</strong></p> <p>‘Pfizer had discovered a compound, but dropped it for various reasons. We found that it blocks the NLRP3 inflammasome. The compound worked in models of multiple sclerosis, in sepsis, in Parkinson’s disease and in Alzheimer’s too. We were keen to take this further and we set up a company (in 2016) to do so, Inflazome.</p> <p>‘There are lots of compounds on the shelf that drug companies could take down and dust off. Often they see side-effects and that puts them off, especially if they do not know how the compounds works.’</p> <p><strong>You also worked on the MICROINNATE project which looked at RNA switches. Can you tell us about that? </strong></p> <p>‘MicroRNAs were discovered about 15 years ago. These are small pieces of RNA that can stop cells making specific proteins. My lab was one of the first to discover their role in the innate immune response and we found that they were one of the key controllers in immunity. Efforts to use them as a therapeutic stalled initially, but there are now companies looking to use RNA as a drug.’</p> <p><strong>You are a busy researcher, but you’ve taken time to set up companies: why?</strong></p> <p>‘As a scientist, your main passion is to make discoveries. If you do find something interesting, what do you do next? It’s taxpayers’ money funding research, so you have an obligation to exploit these discoveries or to pass it on to someone who will. One way is to form your own company. The biggest thrill is to help patients. That is always at the back of your mind. Imagine if your discovery, from noodling as I call it, makes a difference to people’s lives.’</p> <p><em>The MICROINNATE project was funded by the EU’s European Research Council. If you liked this article, please share it on social media.</em></p> <br /> <img src=”http://www.google-analytics.com/collect?v=1&tid=UA-40077089-1&cid=understanding-immune-system-switches-will-spark-new-drugs&t=event&ec=republish&ea=read&el=understanding-immune-system-switches-will-spark-new-drugs&cs=republish&cm=republish&cn=republish&cm1=1" /> This post <a href="https://horizon-magazine.eu/article/understanding-immune-system-switches-will-spark-new-drugs.html">Understanding immune system switches will spark new drugs</a> was originally published on <a href="https://horizon-magazine.eu/">Horizon: the EU Research &amp; Innovation magazine | European Commission</a>. Professor Luke O’Neill, Trinity College Dublin, Ireland. Your work focuses on the innate immune system. Can you explain what this is? One of the effects of the innate immune system is inflammation. Why is this an important area of research? ‘The normal job of inflammation is to fix tissues. If you sprain your ankle and get an injury, inflammation is triggered to repair the wound. Can you give us an example of where this approach is showing promise? ‘A type of protein called Toll was discovered in fruit flies, and then versions were found throughout nature. We realised they were important more generally in the innate immune system of organisms, including in people. My lab looked at how (toll) receptors triggered macrophages (immune cells that attack bacteria and other invaders), and discovered a key switch called MAL. These discoveries provided new targets to fire drugs at. What other examples of chemical switches there? ‘The brain has come into focus. We are more aware now that immune dysfunction is involved in diseases like Alzheimer’s and Parkinson’s disease, but also depression and, amazingly, schizophrenia too. Recently you happened upon a drug that had been tested and dropped, but you believe this drug can be used for patients? ‘Pfizer had discovered a compound, but dropped it for various reasons. We found that it blocks the NLRP3 inflammasome. The compound worked in models of multiple sclerosis, in sepsis, in Parkinson’s disease and in Alzheimer’s too. We were keen to take this further and we set up a company (in 2016) to do so, Inflazome. You also worked on the MICROINNATE project which looked at RNA switches. Can you tell us about that? You are a busy researcher, but you’ve taken time to set up companies: why? The MICROINNATE project was funded by the EU’s European Research Council. If you liked this article, please share it on social media.